β-actin is one of six different actin isoforms that have been identified. The actin molecules found in cells of various species and tissues tend to be very similar in their immunological and physical properties. Therefore, antibodies against β-actin are useful as loading controls for Western Blotting. However it should be noted that levels of β-actin may not be stable in certain cells. For example, expression of β-actin in adipose tissue is very low and therefore β-actin should not be used as loading control for these tissues. Antibody can detects endogenous β-actin protein. 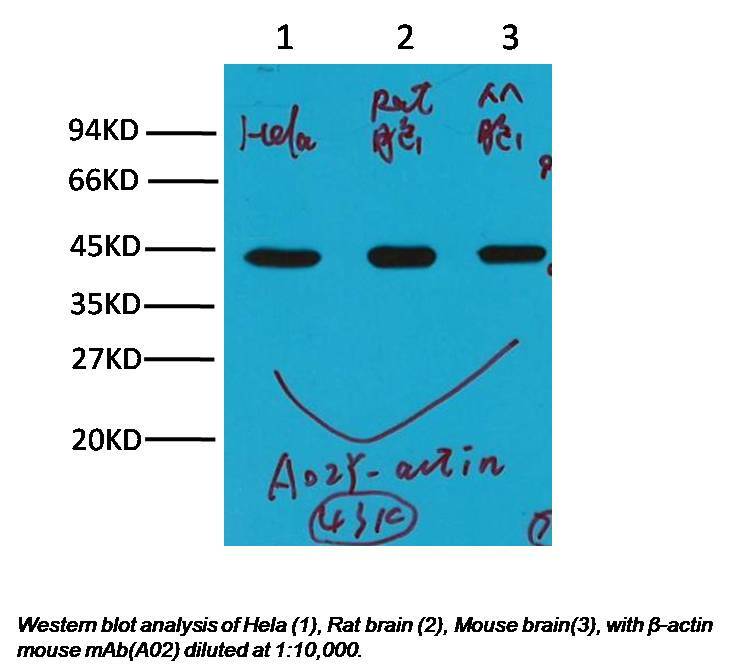 Western blot analysis of Hela (1), Rat brain (2), Mouse brain(3), with β-actin mouse mAb(A02) diluted at 1:10,000.